No matter how carefully you plan a retrofit or design a building, the occupants hold the keys to environmental performance. But design teams can help them unlock any building’s potential. CEUs are available for this article. Click here to learn more and take the quiz. 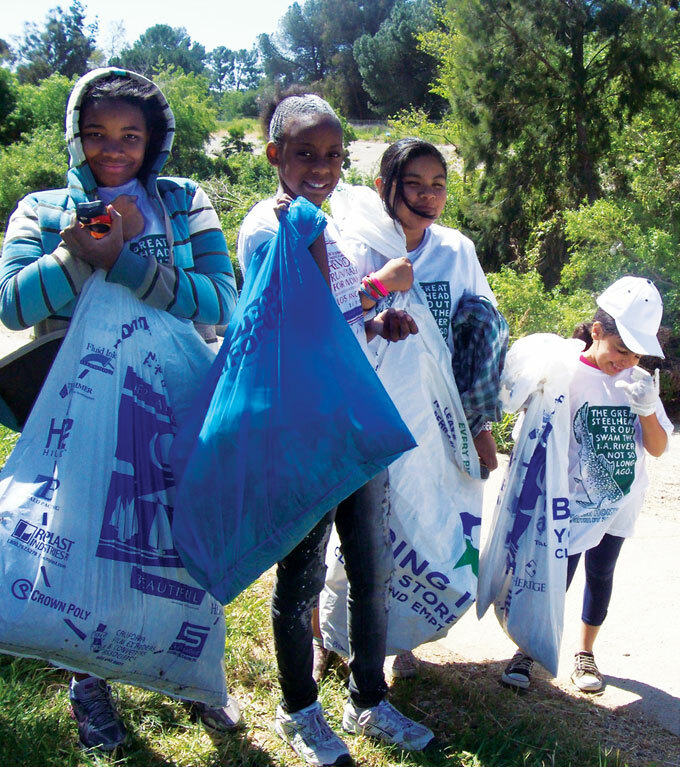 Khalana McDonald, BeJanai Reed, Ana Sicay, and Klara Shawky help clean up the Los Angeles River during a Green Living Youth Program event sponsored by Ivy Terrace, the LEED Platinum affordable housing complex in Los Angeles where they live. This resident engagement program offers weekly get-togethers focused on sustainable living, including energy conservation and recycling, and participating households receive free green cleaning products and workshops for adults. It‘s a sunny November afternoon in downtown Syracuse, New York. Though the day has been unseasonably warm, the sun has just started to go down, and the temperature drops sharply. Throughout the quiet hallways of a LEED Platinum test-bed facility designed by Toshiko Mori and owned by the Syracuse Center of Excellence, small green lights far above eye level turn off. Red lights above them begin to glow instead, indicating that right now would be a very bad time to open a window. Although this may sound like an unobtrusive but clear communication system, its effectiveness depends on a wild card: occupants. In this case, most building occupants either didn’t notice the lights or didn’t understand why they kept changing. These aren’t just any building occupants: most are researchers who use this state-of-the-art building specifically to conduct energy and indoor environmental quality experiments. Like everyone else, though, when building scientists get hot, they open windows. And they kept doing so, even though the HVAC system in the building automatically shuts down when windows are open—a feature that in a poorly performing building might have led occupants to quickly close the windows again. This particular story has a happy ending: information coordinator and building manager Tim Benson made sure each building occupant understood what the lights were for and why they were important for meeting building performance goals. Now, when the red light glows, the windows stay closed. While the original lights remained the same, they didn’t serve their original purpose until building occupants learned how to interpret and respond to them—that is, until occupants were engaged. 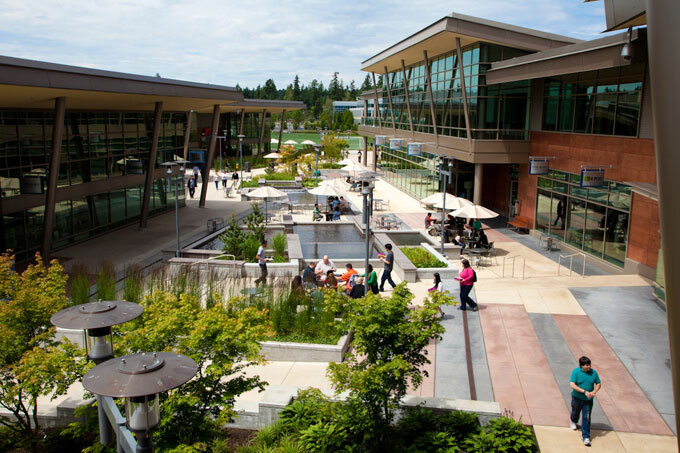 Working with Lawrence Berkeley National Laboratory, Microsoft is using its campus as a “living lab” to test the role of information technology in energy management. The pilot so far has emphasized operations, but the focus will shift in the second phase to how data can be used to engage building occupants. occupant engagement describes a building-wide culture in which empowered building occupants are aware of and accountable for their own energy and water use, waste disposal habits, and use of toxic chemicals. But the process of creating that culture—including decisions made by architects and engineers as well as building managers, employers, and other stakeholders—is also called occupant engagement (or sometimes, more clinically, “behavior change”). We spoke with designers, software companies, property managers, and researchers who are working in this emerging area of interest in sustainable design. All shared real-world stories of successful occupant engagement strategies, which fall into three main categories: designing for feedback, transforming social norms, and creating incentives. “When we talk about a high-performance building, there’s been a lot of focus on design and construction,” says Barbara Ciesla, vice president of sustainable design and consulting at HOK. Understandably so: architects, engineers, and builders do not directly control how a new or renovated building will be managed and used after the keys are handed over. On the other hand, the sustainable design community has made an implicit (and sometimes explicit) promise that it can deliver measurable energy and water savings by designing better buildings. As more and more data comes in from newly built and retrofitted buildings, though, actual outcomes often don’t compare favorably with energy performance predicted by modeling software. It is not uncommon to see energy and water use that is double that of modeled performance. EBN that in the properties they manage, an average of 50%–60% of energy use is directly related to how commercial building tenants use their space. With that in mind, she suggests, the design community could—and perhaps should—have a larger and more proactive role in how people use their buildings after moving in. 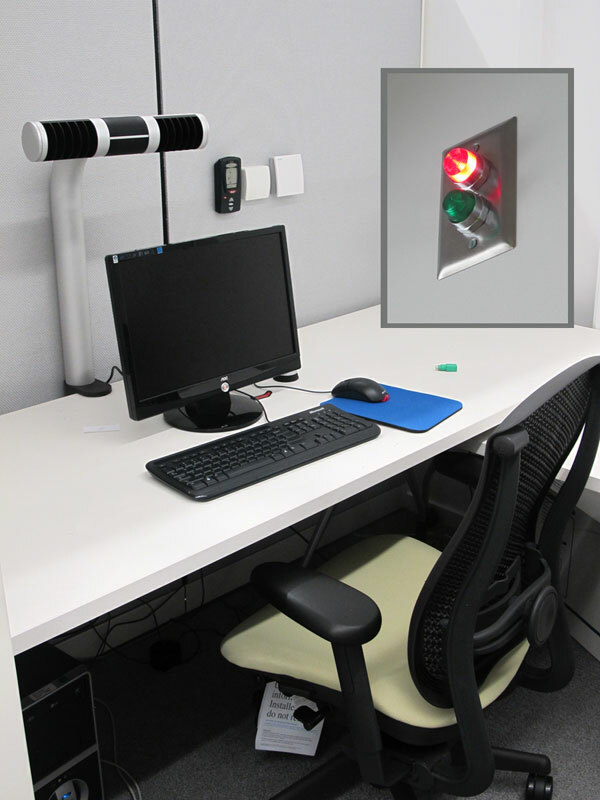 The Syracuse Center of Excellence building is an owner-occupied test-bed facility dedicated to studying the relationship between indoor conditions and productivity; test subjects sit at workstations like these while researchers test their responses to changing comfort and air-quality conditions. Despite the organization’s mission to reduce energy use and improve environmental performance, researchers have been known to ignore signals (see inset) designed to keep them from opening windows when outdoor conditions are unfavorable. Happily, advances in information technology are making these systems easier and less costly to deploy. Not only are building management systems (BMS) themselves rapidly becoming more sophisticated but also new “smart building” software can streamline and analyze data even from existing older systems, increasing the ability of the BMS to provide meaningful, real-time information to building managers and occupants alike. without directly engaging building occupants provides “continuous commissioning” capabilities that can lead to 10%–30% energy savings. While individuals can certainly take action and save energy without sophisticated tracking and feedback tools, there can be little accountability without them: they are at the root of the emerging movement toward systematic, data-driven occupant engagement that combines readily with everything from remote-access wireless digital controls to social media platforms. Just as important as having good systems in place, says Frankel, is constant communication throughout design regarding what clients can realistically expect from their buildings. “The energy modeling is not necessarily wrong,” Frankel argues. However, “half the inputs in the model are just guesses about how the building will be used”—which means that common post-occupancy scenarios, such as employees working longer hours than predicted, could cause unpleasant surprises. The burden is on the design team, Frankel says, to ensure clients understand that the energy model relies on the clients’ own assumptions. Communication need not end after construction is complete. Post-occupancy surveys and performance validation are becoming more common, and both present opportunities for the design team to help clients leverage the building’s design features to implement effective occupant engagement programs. As Frankel puts it, “In terms of energy efficiency, we’ve gotten much of the sweet stuff out of the design side but haven’t done anything on the operating side.” As the market shifts toward outcome-based performance documentation, design teams may be in a unique position to offer occupant engagement as a consulting service, expanding their offerings during a recession that continues to cripple the construction industry. HOK has started blazing that trail by piloting a massive tenant and occupant engagement program at the Toronto-Dominion Center, a six-tower, 4.3 million ft2 complex designed by Ludwig Mies van der Rohe. The center has 90 tenant organizations and 21,000 occupants; tenants are directly responsible for 55% of energy use in the buildings. HOK manages this program—and, according to Barbara Ciesla, a sustainable design firm has just the right expertise to perform this service. EBN, and architects have a great deal of experience with facilitating discussions among a variety of stakeholders and experts, particularly if they practice integrative design. Moderating these discussions and helping implement the results also go more smoothly if the facilitator has a thorough understanding of buildings and the way they operate. “You spend half of the time with tenants and occupants and the other half with the building management team to ensure things will come online when tenants expect,” she said. “Otherwise tenants lose confidence” in the program and subsequently disengage. HOK’s long-term vision for this program is nothing less than a complete transformation of social norms within the center in regard to energy, water, waste, and indoor air quality. “We wanted to start with a little building to test,” Ciesla joked, but instead HOK is facilitating conversations, developing communications, and ensuring accountability for a major property management company and a green council representing more than 60 tenant companies. “We try to make it as easy as possible,” she added. Simplifying sustainability is key to the process of tenant and occupant engagement, but little signs on light switches and even workstation energy dashboards are not enough. As demonstrated by the Syracuse Center of Excellence, true occupant engagement does not stop with a building-wide communication mechanism: communication is a big part of occupant engagement, but it must be contextualized, direct, visually engaging, meaningful, and part of a larger action plan. community-based social marketing (CBSM) as the model: while a typical marketing campaign focuses almost exclusively on one-way communication and may temporarily raise awareness about an issue, CBSM involves intensive, interactive work and two-way feedback at the community level and focuses on simple and incremental changes in habits, setting measurable short- and long-term goals and tracking progress. Communications are simple and occur within the context of the marketing campaigns. During the first phase of the energy campaign at the center, stakeholders met for a charrette-like discussion of the problems that needed to be solved and which aspects of these problems each stakeholder group could control. This discussion was eventually refined down to three actionable bullet points for each of three groups—landlords, tenant companies, and individual occupants. Landlords committed to re-lamping. Tenant companies agreed to do nighttime walk-through audits of lights and equipment left on. Occupants would turn off computers and monitors at night. During the first night of walk-through audits, employers left one of two small cards at each workstation, based on whether equipment was powered off: one thanked employees for contributing to the company’s energy goals and informed them they had been entered in an iPad raffle; the other simply stated that computers, chargers, or lights had been left on. Tenant companies will do these audits at random, roughly on a quarterly basis, but one company did another almost immediately and found a 12% increase in equipment powered down overnight. After the first phase of the energy campaign was over, HOK reported overall energy statistics in the lobby of each building using eight-foot-high red numbers. Although they might not always call it by the same name, multifamily communities have been working with CBSM models in their resident engagement programs for a long time. Enterprise Community Partners, a nonprofit focused on affordable housing, has developed communication pieces and workshops on topics like green cleaning and nontoxic pest control for multi-family residents; Enterprise also distributes grants to fund resident engagement programs throughout the U.S. The Green Living Youth Program at Los Angeles-based Abode Communities recently received one of these grants for its youth engagement activities at a new LEED Platinum community called Ivy Terrace. “Overall, our resident services program, called Beyond Home, has a large focus around the youth in our buildings,” explained Abode’s president and CEO, Robin Hughes. Education programs for children are always “a tremendous opportunity to engage parents,” said Hughes, and at Ivy Terrace this is even more powerful because of the diversity in language among residents. Because the children are bilingual in English and their home language, the Green Living Youth Program “was an opportunity to educate, inform, and engage the youth but also an opportunity to bring the parents into the process,” with children acting as translators and “leaders in their families.” The program includes after-school and weekend activities, like workshops on how to build a solar oven out of a pizza box or how to turn discarded household items into container gardens. “To bring something to a person’s front door makes it more accessible,” said Hughes. While the opportunities to engage one-on-one with building occupants in an affordable housing community differ from those of engaging occupants in a fast-paced office building in Toronto’s financial district, the goals and the methods of changing social norms are essentially the same. Not everyone has the resources to develop and implement a multi-faceted, long-term cultural transformation program. Fortunately, raising awareness about sustainability goals and providing incentives for meeting them can still achieve measurable results that can continue for the long haul. Competitions are a popular way to accomplish this, and some of the same communication strategies used to bring about longer-term social transformation can also be used in the context of such events. 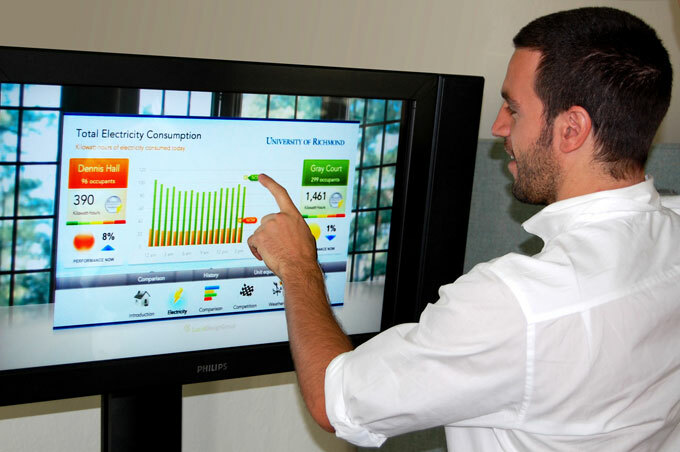 The Building Dashboard Kiosk is designed to make it easy for facility managers as well as individual building occupants to analyze and compare real-time energy metrics based on customized inputs. Photo: Lucid Design Group Inc. Colleges and universities have been early adopters of aggressive energy and climate goals, says Andrew deCoriolis, public programs manager at the software company Lucid Design Group Inc. More than 600 have signed the American College & University Presidents’ Climate Commitment, which calls for gradual elimination of greenhouse gas emissions from campus operations and implementation of sustainability curricula and campus-wide community engagement plans. Lucid makes the Building Dashboard Kiosk, a data monitoring and visualization tool that can be installed in existing buildings. College campuses have been early adopters of this tool as well, since it links to social media platforms and helps connect the two disparate parts of the Presidents’ Climate Commitment—facility management and student education and engagement. Connecting energy data and existing social media networks is a key component of student engagement. “You need to meet people where they are,” deCoriolis emphasized, and “create a social context for why they’re going there” for energy data. A competition gives students this “social context” in which to track their energy and water use and to make public commitments to changing habits. “As we had people logging in through Facebook and making commitments, the next step we’ve been doing is building email lists” to give them “little tips and behavior prompts,” said deCoriolis. He warns that organizers need to be careful about the sort of feedback they offer: discouraging and shaming tend to make people angry rather than engaged. However, some types of “community-based normative feedback”—where people’s habits are graphically compared with the norm—have been shown to work. The Campus Conservation Nationals, in addition to comparing energy data among campuses, also has a collective goal of reducing the campuses’ overall energy use by one gigawatt-hour during the 11-week contest period. Allowing every college and university to contribute to this overall goal regardless of their ranking in the competition could help reduce some of the negative effects potentially associated with such challenges. If friendly competition can take place in a positive social context (intercollegiate contests, for example, may be inherently friendlier than contests between corporate competitors), the results can be longer-lasting than expected, says deCoriolis. “We found through survey work and through the real-time data that we’ve been collecting in these buildings that [occupants] have learned something during the competition, that they’re willing to continue those actions after, and that oftentimes competition savings are sustained to some degree.” He concedes that “to what degree depends on how you measure,” particularly since student populations cycle every academic year, but students appear to be more aware of and willing to control habits that increase their energy use even after a contest is over. By visualizing its inter-office “Energy Cup” competition as an electric car race, Perkins+Will helped individual employees see how well they were doing compared to both a pace car and other offices. EBN that the firm is planning a second competition for 2012. “The first one was a really good scoping study in terms of what was possible,” he said. “I don’t think we realized how much it could reduce energy use.” But based on survey results after the first challenge, the second competition will go on for a longer period and will involve more offices. Because the firm is attempting to conduct research to benefit its clients in addition to reducing its own carbon footprint, Driedger has invited impartial observers from University of California–Berkeley’s Center for the Built Environment and other research centers to document the next iteration of the challenge. He hopes that making the competition less “in your face” will increase occupant engagement and result in longer-term change. While these are admirable and potentially enlightening efforts to change occupants’ habits, incentives do not need to be elaborate or competition-driven. The type of feedback provided to alert building occupants to their energy use can make a big difference in how responsive people are. Adding a smiley face to customers’ bills helped Sacramento Municipal Utility District keep its most energy-conserving customers from sliding toward the middle of the spectrum. The very simplest sort of “incentive program” can come in handy even in situations where extra motivations might not seem necessary. In a presentation at the 2011 Greenbuild conference in Toronto, Jenny Carney, a principal at YR&G, told the story of a new look for utility bills sent to customers of Sacramento Municipal Utility District (SMUD). Instead of merely stating kWh and amount owed, the bills placed the customer’s usage on a spectrum from higher than average (red) to lower than average (green). At first, this visualization had mixed results: SMUD found that both high-demand and low-demand users tended to drift toward the middle of the spectrum when given this feedback. 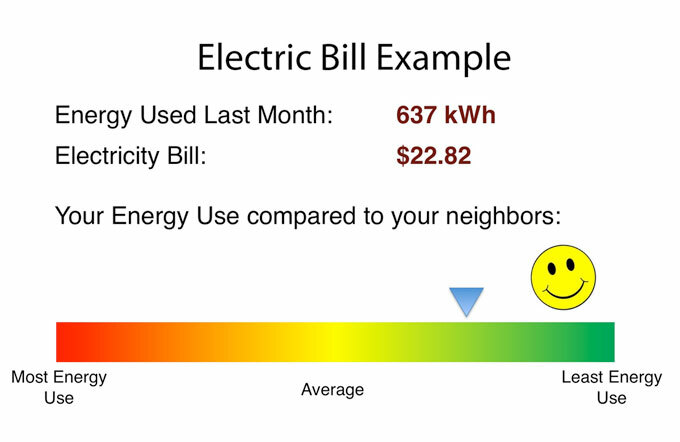 Then the utility added something extra: for lower-than-average use, customers received a smiley face, and for higher-than-average use, a sad face. According to Carney, the sad face backfired, resulting only in angry calls from SMUD customers. The smiley face, on the other hand, helped; by adding a “reward” that makes it clear that low energy usage is a good thing, SMUD has helped prevent its energy-conserving customers from regressing toward the mean. less sustainable choices as well. Remember that nighttime auditors at Toronto-Dominion Center distributed two types of cards—both thank-yous and reminders. deCoriolis shares the story of a Massachusetts boarding school that recently held an inter-dorm energy use competition. “The resident advisors in the boys’ dorms knew the boys were staying up late to play video games well after lights out and curfew, because they could see the energy on the dashboard in real time,” deCoriolis said. The boys had to be held accountable for that—more because they stayed up too late than because they were using too much energy, but the story still points to a fairly tricky issue. Can occupant engagement really work in the long run if it is exclusively positive and upbeat? And can it be framed as something other than surveillance if it isn’t? EBN found that rhetoric around occupant and tenant engagement is almost universally about motivation, inspiration, fun, and social change. But realistically, as occupant engagement—combined with the capability to track energy use at an unprecedented granular level—becomes more mainstream, we can probably expect the word “compliance” to enter the occupant engagement glossary. Newly emerging pressures in the commercial building market could speed the arrival of that day. As more and more building owners seek Energy Star labels or LEED for Existing Buildings: Operations & Maintenance (LEED-EBOM) certification—both of which are based on actual building performance—tenant companies and their employees also need to be on board with building-wide goals. And as Adam Sledd, program manager of the green leasing and federal buildings program at the Institute for Market Transformation (IMT), points out, the U.S. government and many local governments are raising standards for the buildings where they lease as well: if a landlord must achieve an Energy Star rating in order to retain a government tenant, then poor energy performance by other tenants would jeopardize the landlord’s business. Even without green leases or building rating and disclosure laws in play, many large companies have set their own aggressive carbon goals and committed to transparency about their own performance. How all these emerging market forces and pressures might play out for individual employees remains to be seen, but increasing accountability in the larger commercial building marketplace will undoubtedly lead to increasing accountability for departments and individuals within tenant companies—as is happening already with department heads at Microsoft—thus creating a greater need for effective, long-term occupant engagement programs and strategies. During a press event introducing Microsoft’s paper on energy-smart buildings to the public, Kathryn Willson, director of partner strategy in the company’s environmental sustainability department, made a confession: she has a space heater under her desk. And one day while she was toasting her toes, senior operations manager Darrell Smith noticed the spike in energy use at her workstation and dropped by to see what was going on. “Some people are just always cold,” explained Willson. “I’m one of them.” The two had a jovial and ultimately productive exchange about the comfort level at Willson’s desk, and the operations folks managed to identify and repair the problem. Thanks to that conversation, Willson hardly ever needs her space heater anymore. As much as we might like to design, build, and automate our way out of excessive consumption, we need to remember that occupant comfort and productivity are part of building performance as well. Design and automation will never get us all the way to the finish line—particularly if the finish line is zero environmental impact. No matter how many low-emitting carpets we specify, solar panels we install, or recycling bins we place in the lobby, building managers will continue to spend part of every day in conversations with building occupants about open windows and space heaters. The question is, what can the green building community do to make those conversations easier to have and more productive? Receive continuing education credit for reading this article. The Green Building Certification Institute (GBCI) has approved the technical and instructional quality of this course for 1 GBCI CE hour towards the LEED Credential Maintenance Program. The International Living Future Institute (ILFI) has approved this course for 1 LFA hour. Restate at least five methods being used to provide feedback to occupants so that they better understand how to interpret, and respond to, their energy use; describe several promising features of the most effective utility feedback programs. Provide at least two examples of how green-building professionals might employ "integrative design" to transform the "social norm" of limited occupant-engagement. Considering different occupant-engaged scenarios (college dorm; corporate office; mixed-tenant development), distinguish between incentives that may encourage--or fail to encourage--long-lasting, energy-saving efforts by occupants. Explain how various compliance practices may alter the occupant-engagement terrain (and explore what strategies designers might employ to ensure that occupant-engagement conversations remain productive). To earn continuing education credit, make sure you are logged into your personal BuildingGreen account, then read this article and pass this quiz. Use the following questions to inform class discussions or homework assignments. Why can't energy models and energy efficient design features guarantee that a building will use little energy? What types of incentive programs for occupant engagement and energy savings are discussed in the article? What are the benefits and drawbacks of different types of incentives? Imagine you are developing a model to predict energy use for an office building. What kind of information would you need about how the occupants will be using the building to accurately predict energy usage? How would you get that information? The article addresses an approach to occupant engagement calledcommunity based social marketing. How does this model approach occupant engagement? Imagine that you own a mixed-use commercial building that is shared between a clothing store, a restaurant, and an office building. Discuss some strategies you might implement to encourage energy conservation by your tenants. In practice, a building designed with excellent ‘green’ performance standards can be severely compromised because the specification and mechanical performance fail to adequately account for the inhabitant’s needs, expectations and behaviors. There is an interesting new set of research focused on how to really understand occupants' interactions with buildings that is both valuable in this setting, and changes the conversation. Work by Jacqueline Vischer (BRI Volume 36, number 3) suggests the extent to which occupants' experience is driven by many factors outside of their office building (like how far they travel to work and how their kids are doing in school). Examples of building operational changes yielding 40% or 50% energy savings (See "Best Practices in Strategic Energy Masterplanning" from Cleanmed 2011) also illustrate that the biggest savings are likely to come from professionals who are 1) at the building, and 2) have some vested interest in reducing environmental impacts. Some plug loads are unavoidable - people generally need to be using their computers. The others are likely best attacked by building managers, getting the systems right and reducing their use. It seems pretty clear that while getting the rank and file in an office building to pay attention to their energy and water usage is fun and maybe useful, the real work of "tenant engagement" is engaging the building operators and space managers for tenant organizations. In many ways, this approach is not only more effective, but much easier to do. You're doing really important work. Thanks for sharing your page of resources with us. Please keep us updated about your research. Any key preliminary take-aways so far? This is a great article that highlights so many different aspects of occupant engagement. Where to start? As someone who works for a builder and property manager, I see the lack of communication between Owners, Property Managers, and Tenants far too often. I agree that there is a lack of open dialogue between these parties. On almoist every LEED project I work on, Owners are terrified of issuing an Occupant Comfort survey to their tenants. These surveys and this feedback should be viewed as a positive experience and a chance to become more efficient. I work in an older office building without occupant sensors and every night I still have to walk around and shut off people's office lights and unplug their phone chargers. These are my collegues who know better. This is not for a lack of information, maybe its lack of motivation. A marketing campaign may be just the thing. I toured the Packard Foundation once and thought the green light meant to indicate it was OK to open the windows was clunky. In this article a similar installation has questionalbe results without proper education. I think the key is engagement. One of the buildings I manage construction in has a simpler system - open the window and the heater/cooler shuts down (per zone); so you have to make nice with your co-workers or they will goat you into compliance for their own comfort. I think designers can further streamline the individuality of systems so each person can be comfortable. I find the idea of community-based social marketing interesting, mostly for it’s emphasis on the involvement of the community. However, with the example given, (doing X correctly allows you to be in the running for some type of reward), I feel like there could be too much emphasis placed on doing a good behavior that will net the occupant something. While the end goal should be attainable, I'm uneasy with it resulting in a material reward (such as the example listed, with an iPad); I think that puts greater emphasis on ‘I’m only going to do this because I may attain X’ rather than ‘I’m going to do this because it could add to my well being or present value to me in some way’. Can Buildings Teach Sustainable Behavior? Architects Fight Obesity Epidemic Through "Active Design"